Many surgeons find it practical to use the “tray” method to assemble instruments. 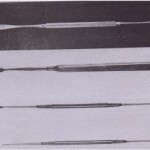 Standard sets of instruments are packaged together, sterilized, and unwrapped at surgery. 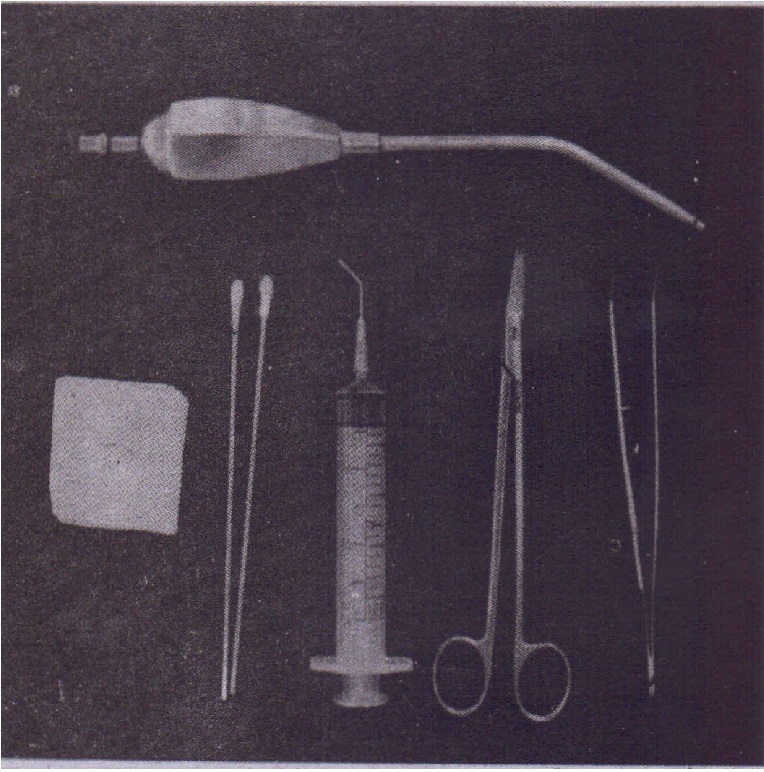 The typical basic extraction pack includes a local anesthesia syringe, a needle, a local anesthesia cartridge, a woodson elevator, a periapical curette,a small and large straight elevator, a pair of college pliers, a curved hemostat, a towel clip, an Austin retractor, a suction, and gauze (fig. 6-62). 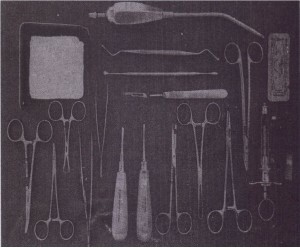 The required forceps would be added to this tray. 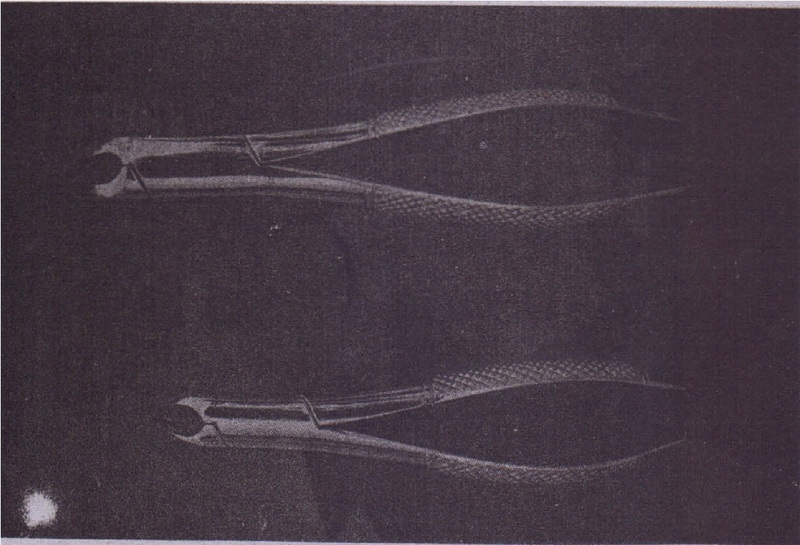 A, Side view of English style of forceps. 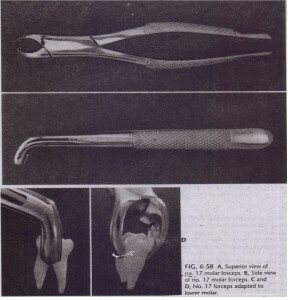 B, Forceps adapted to lower premolar. 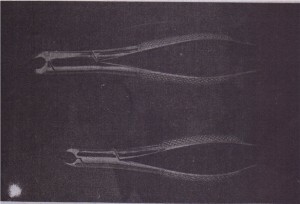 forceps adapted to lower molar tooth. No. 151S (bottom) is the smaller version of no.•151 (top) and is used to extract primary teeth. 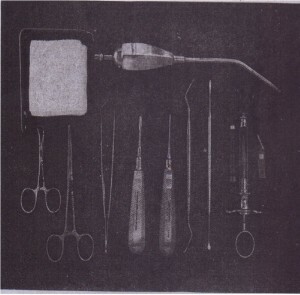 A tray used for surgical extractions would include the items from’ the basic extraction tray plus a needle holder and suture, a pair of suture scissors, a periosteal elevator, a blade handle and blade, Adson tissue forceps, a bone file, a tongue retractor, a root tip pick, Russian tissue forceps,a pair of Cryer elevators, a rongeur, and a handpiece and bur (Fig. 6-6.). 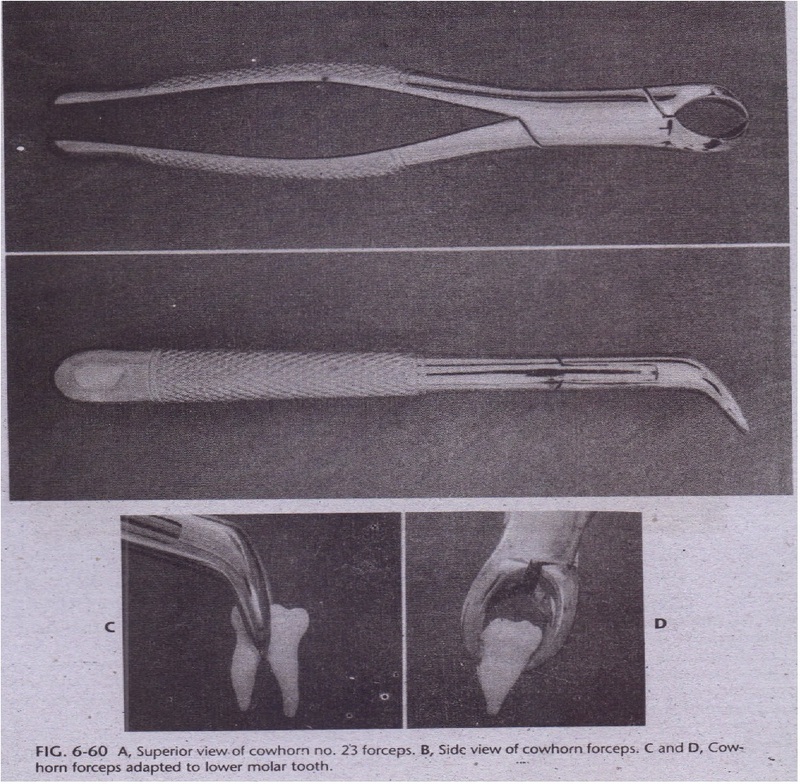 These instruments permit Incisron and reflection of soft tissue, removal of bone, sectioning of teeth, retrieval of roots, debridement of the wound and suturing of the soft tissue. The biopsy tray includes the basic tray, plus a blade handle and blade, needle holder and suture, suture scissors,Metzenbaum scissors , Allis tissue forceps, Adson tissue forceps, and curved hemostat (Fig 6·64), These instruments permit incision and dissection of a soft tissue specimen and closure of wound with sutures. 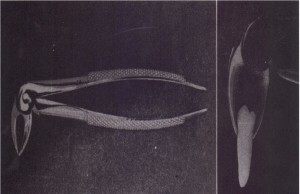 bone, section teeth, retrieve.roots; and suture flaps back into position. 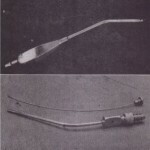 The postoperative tray has the necessary instruments to irrigate the surgical site and remove sutures (Fig. 6-65). It usually includes scissors, college pliers, irrigation syringe, applicator sticks; gauze, and suction. 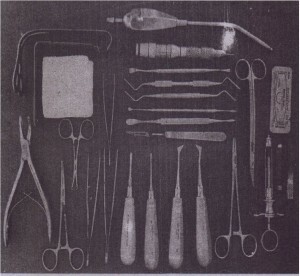 The instruments may be placed on a flat tray, wrapped with sterilization paper, and sterilized. 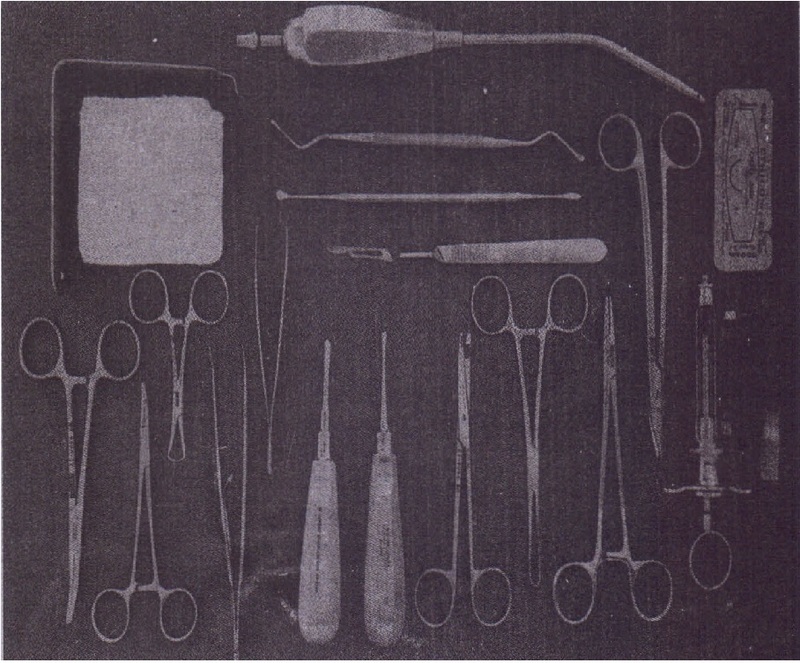 When ready for use, the tray is taken to the operatory opened, and the instruments used from the tray. This system requires a rather large autoclave to accommodate the tray. Alternately, metal cassettes can be used instead of a tray. They are more compact but must also be wrapped insterilization paper (see Fig. 5-6). 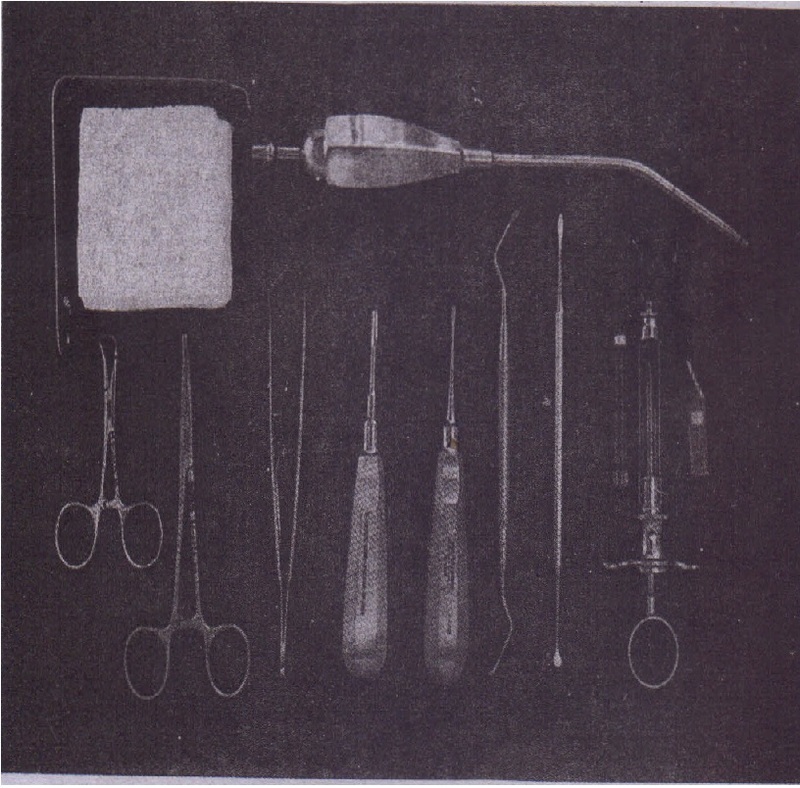 Postoperative tray includes instruments. 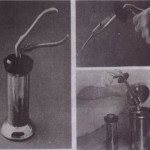 necessary to remove sutures and irrigate mouth. 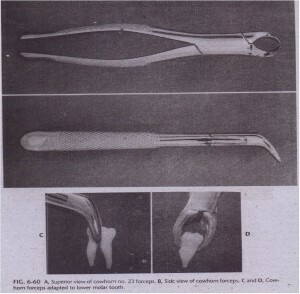 The appendix includes prices for the instruments-listed for these trays. 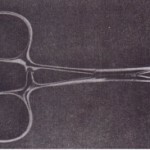 A casual review of the cost of the surgical instruments will reflect why-the surgeon and staff should make every effort to take good care of instruments.